Davitt Electric offers electrical construction services for new home building as well as commercial structures in Northwest Arkansas. Residential electrical construction services, whether new or retrofit, require a reputable, knowledgeable electrical specialist who could help with developing and also installing challenging electrical systems. This keeps the family’s most valuable properties risk-free from electrical as well as fire risks. Davitt Electric, among Northwest Arkansas’ most trusted electrical contractors, has all the experience and credentials needed to place your mind at ease and also get your electrical tasks finished. If you are having a new home built you need to have it wired by professionals. Call on Davitt Electric for our new home electrical construction services. When construction demands electrical job, you’ll remain in good hands. When setting off to construct a new home, it’s vital to have all of your wiring as well as other electrical work up to code. The high standards are set forth by the state of Arkansas. The dangers that wiring creates to a new structure make it very prone to fires if not set up correctly. Incorrect wiring jobs occur all the time. If they are not done by licensed professionals, you may be in for a big problem. Never ever try to wire your very own home. If you do not have any kind of working knowledge of electrical circuits, there is no need to be trying to mess with it. This is why you require specialists. Call Davitt Electric and we will set your new home up with a safe and efficient electrical system. Do not splice wires in between the junction boxes. Discharges are a result of poor wiring gone wrong. A spliced wire is a live wire that, when touching another thing, can be really unsafe. 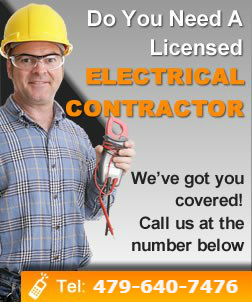 Your new home or structure will take the work of a professional electrician to make it operate correctly. We provide new construction services in Northwest Arkansas for new homes and also commercial structures. Call us today at (479) 640-7476.